The Nexus One features a 1GHz Qualcomm QSD 8250 processor with 512MB of RAM. The iPhone 3GS features a 600MHz 32-bit ARM Cortex A8 RISC processor with 256MB of RAM. The Nexus One's "Snapdragon" processor has onboard graphics that Qualcomm claims to produce 22 million triangles per second which, on paper, beats the iPhone's PowerVR SGX which is rated at 7 million triangles per second. Both phones use flash memory for non-volatile storage. 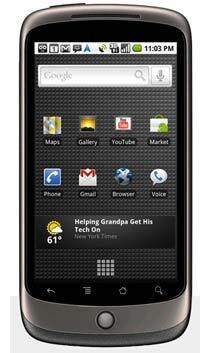 The Nexus One comes with built-in 512MB flash memory pluse a 4GB microSD card standard, upgradeable to 32GB. The iPhone 3GS gives you the choice of 16GB or 32GB non-removable flash memory. As we talked about in our Droid Eris article, the Android OS on the Nexus One allows you to have multiple apps loaded and running. The iPhone has to quit each app to launch another, though it does let you continue with a phone call while you run an app. One downside of multitasking is that the battery runs out of juice faster, especially if those apps continue to diddle in background. Another downside is that you can potentially use up all of RAM with multiple apps loaded, though HTC assured me that when that happens, the "oldest, least active" apps are terminated to make room. Though the number of available apps for the Android based phones pales in comparison to the number available for the iPhone, many of the most useful ones already exist in either identical or similar form. The Nexus One's screen is slightly larger than the iPhone 3GS (3.7" vs 3.5") but the resolution is much higher (480x800 vs 320x480). How does that affect you? Check NBA games with SportsTap. The Nexus One displays the status of 12 games on a single screen. The iPhone displays 8 games. The Nexus One has a 5 megapixel camera with an LED flash for low light settings. The iPhone 3GS has to limp along with 3 megapixels and NO flash. The Nexus records video at 720x480 at 20fps while the iPhone records video at 640x480 at 30fps. We tested the Nexus One on our lab's WiFi setup (AirPort Extreme Base Station connected to 50Mbit/s internet service.). It measured 9.7Mbit/s download and 4.4Mbit/s upload. While that's a big improvement over the Verizon Droid Eris (3.1Mbit/s download, 1Mbit/s upload), the iPhone 3GS recorded equal download speeds (9.8Mbit/s) and faster upload speeds (9.1Mbit/s). We have limited experience with the T-Moblie 3G network. We'll have more to say about it in a few days. Try going to http://newionicbulb.com/ on your iPhone. Then try it with an Android phone. Though fractionally taller than the iPhone 3GS, the Nexus one is narrower and thinner. And it weighs slightly less than the iPhone 3GS. HOW DOES THE NEXUS ONE FALL SHORT OF THE iPHONE 3GS? 1. It lacks sync-abiility with OS X apps like iTunes, iCal, iPhoto, Notes, and Address Book. You can mount the microSD card to import photos to iPhoto or copy tunes to the Nexus One that can be seen by the music player, but there is no comprehensive, automated sync/backup for OS X users. If you choose a smart phone running the Android OS, I recommend MyBackup Pro app which can backup everything (including apps) to the microSD card or everything (not including apps) to an online server. Also if you use Google Mail, Calendar, and Address book, you can sync with those items between the Android phones and your online Google account. 2. It lacks support on Verizon Wireless and AT&T Wireless, the two largest USA cellular service providers. Currently only T-Mobile service is available to Nexus One early adopters. That's supposed to change in the near future, but until then, the Nexus One's potential customer base will be constricted. If the Droid Eris (Android 1.5) fires a shot across the bow of the Apple iPhone 3GS, the Nexus One (Android 2.1) rams it broadside. It is slim and fast and affordable (with a 2 year calling plan). Competition improves the breed. The consumer wins as smart phone companies shoot it out. Comparison the cost over 24 months of the iPhone 3GS versus three Android phones. Comparison of touch screen accuracy of the iPhone 3GS versus three Android phones.